The Kohler Archer K-3551 is an elegant toilet with a very attractive design. The tank is nice and simple but the base really stands out for me. It is not only comfortable to use but also has a powerful, efficient and quiet flush. If you like the look of this model, then I hope this Kohler Archer Toilet Review will answer any questions you may have. As you can see in the image, the tank is quite simple. The tank has a minimal design, however this simple look doesn’t take away from its style. Also, the tank has a vertical handle lever on the left-side. For me, what makes this model look fabulous is the front base design, with its sharp beveled edges. The beveled edge base contrasts well with the round bowl and gives the toilet a real elegant look. The Kohler Archer is also a Comfort Height toilet. 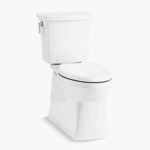 Comfort Height toilets are over 17″ from floor to seat (with seat attached) and are ADA Compliant. An ADA approved toilet is suitable for a wide range of users. This Comfort Height seat will be over 2″ taller than a standard toilet, making it ideal for taller people. An ADA compliant toilet is also more suitable for the elderly, disabled, people recovering from surgery and also anyone that finds it difficult to stand up and sit down. The seating height of this toilet should be similar to the seating height of a kitchen chair. However, it is worth noting that smaller adults and young children may find it more comfortable using a standard height toilet. 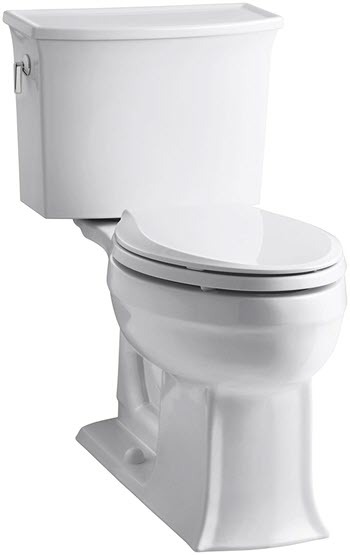 This model is a two-piece toilet and has a elongated bowl. A two-piece toilet will be easier to install but harder to keep clean, compared to a one-piece. Dirt and mold find it easy to grow between the tank and the bowl, so it will need that extra bit of cleaning, every now and again. An elongated shaped toilet is roughly 2″ longer than a standard toilet. An elongated bowl will be more roomy and comfortable for adults, especially larger individuals. That being said, an elongated toilet is a little longer than a standard toilet, therefore if you have a tiny bathroom, take note of the measurements below. It is also worth knowing, that a toilet seat will have to be purchased separately. Using Kohler’s AquaPiston Technology, this toilet is powerful, efficient and quiet. Its AquaPiston canister provides a 360° flush. The flush will reach the whole of the inside bowl, giving it a thorough cleaning each time. The canister also provides a leak-free performance because it has 90% less exposed seal material compared to a 3″ flapper. As with almost all modern Kohler toilets, the Archer is very water efficient. It uses only 1.28 gallons of water per flush. This is 20% less water compared to a 1.6 GPF toilet and makes it WaterSense certified. A WaterSense certified toilet will not only save water, which is great for the environment, but will also lower your water bills, which is great for your pocket. In fact, if you are upgrading from a a standard toilet, that uses around 3.5 GPF, then you will use 16,500 less gallons of water per year. Not bad! As with the majority of modern toilets available today, the Kohler Archer is easy to install and will not need any high level of expertise. Most people should be able to install this toilet themselves, even if you have limited DIY experience. This toilet is a two-piece model, which will come in two separate parts. This means you will have to connect the base to the floor and then the tank to the base. This might take you an extra 5-10 minutes, however a one-piece toilet can weigh over 100lbs. The benefit of having separate parts is that you don’t have to lift a very heavy one-piece into place. The Kohler Archer uses the DryLock™ System installation system, which makes installation even easier and also helps prevent any water leaks. I was going to compare this toilet to the TOTO Drake II which is one of TOTO’s most popular models, however the Drake II looks a bit different. Sure, they have similar features but I wanted to compare like for like. A TOTO toilet that does compare well in performance and looks, is the TOTO Promenade II. These two toilets have a similar design. A solid square base, elongated bowl and a square tank. The Archer has a very simple tank design, where as the Promenade II has a little more tank style. That being said, I prefer the Archer’s base. Both have a square front, however I really like the Archer’s beveled front edges. The Kohler Archer has Comfort Height seating, where as the TOTO Promenade II has Universal Height seating. This is pretty much the same thing. They are both ADA compliant and will measure over 17″ from floor to seat (when a seat is attached). They are both certainly nice looking, classy toilets, but the Kohler Archer looks that little bit more elegant. Both toilets are ADA compliant, with a floor to seat measurement over 17″. The Archer uses Kohler’s AquaPiston technology to provide a 360° flush that will clean the entire inside of the bowl, thoroughly. It boasts a leak-proof performance, which is great to hear for a two-piece toilet. Reviews on Amazon state that it is both powerful and quiet. The Promenade II uses TOTO’s Tornado Flush System. This system uses three water jets that produce a whirpool-like action and will powerfully clear any waste from the bowl. Along with the ceFIONtect glaze finish on the bowl, each flush should leave the bowl very clean. Both of these toilets are highly efficient with their use of water. They are both WaterSense certified and only use 1.28 GPF. Either toilet will be a great water saver and great for the environment and water bill savings. Both toilets are WaterSense certified, using only 1.28 GPF. The Archer and the Promenade II are both two-piece toilets. A two-piece toilet has two separate parts, which will be easier to install and lighter than a one-piece. You should be able to install the toilet yourself, as long as you are able to lift the parts. Most modern toilets are relatively easy to install now, especially, the skirted models. How can you choose between two very similar performing toilets. They are both WaterSense certified and only use 1.28 GPF. Both toilets are ADA compliant, so they are suitable for a wide range of users. The Kohler Archer is a little bit cheaper and it just beats the Promenade II when it comes to elegant style. Therefore, for me the winner is the Kohler Archer. The Kohler Archer K-3551 is a stylish, elegant toilet that will look great in any modern toilet. It has a powerful, efficient flush and Comfort Height seating. What makes this toilet stand out from other models, is its beveled edge base that looks awesome. This toilet is certainly one to consider. Overall, I really like the look of this toilet. Its designer, beveled edged base looks elegant and stylish. It is both efficient and powerful, using only 1.28 GPF. Its Comfort Height seating will be a bonus for many people and of course, its elongated bowl is designed for extra comfort. The Kohler Archer is certainly a great toilet that would be a nice addition to most modern bathrooms. 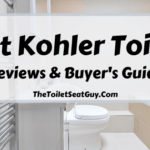 I hope you found this Kohler Archer Toilet Review helpful and I hope it will have answered any questions you may have had. If you have anymore questions on the Kohler Archer or any other Kohler models, then please leave a message in the comment section below.